People are getting increasingly pessimistic about their employment prospects. That’s the message tucked away in the Reserve Bank of India’s (RBI) latest survey of consumer confidence. The survey, carried out last month, obtained households’ perceptions about the employment scenario, among other things, and was conducted by the RBI in the six metropolitan cities of Bengaluru, Chennai, Hyderabad, Kolkata and New Delhi. 32.5% of those surveyed said the current employment situation had improved, while 39.2% said it had worsened. That gave a net response of -6.8 percentage points, after rounding off. The rest reported no change. The accompanying chart has the details. The chart shows the percentage of people saying that the employment situation has worsened is now at the highest level in the last four years (except last December, at the time of the demonetisation exercise, when it was at the same level). Note that the percentage of people saying the jobs market has worsened is now higher than in September 2013, when the economy went into a tailspin because of the current account problems during the taper tantrum. Also, the net response, or the number of people who believe that employment prospects have improved minus those who believe it has worsened, has deteriorated in May 2017, compared to March. That indicates the job market in May was worse than in March, which is surprising, as job prospects should have improved as the effects of demonetisation wear off. It is also surprising that people’s perceptions about the job market are now so much worse than in 2013-14, although real GDP growth has been much higher since then. The chart also tells another story. 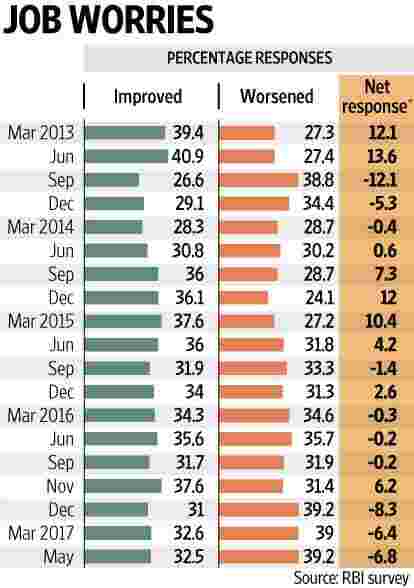 Note how the “net responses" column improves from June 2014, when the present government came to power. By December 2014, the job market had improved tremendously, according to the survey and the “net responses" reached a peak of 12, although it was lower than the level it was at in June 2013. The jobs market seems to have fully recovered from the shock the economy faced from its balance of payments problems in September-December 2013. Unfortunately, after December 2014, employment started going downhill and by September 2015, the percentage of people saying employment was increasing was less than those saying the situation was worsening. It remained that way for much of 2016, although the November 2016 survey showed an uptick. The major economy with the highest growth rate in the world seems to have a major problem creating jobs. After November 2016, the job market deteriorated as a result of demonetisation and, as the latest survey results show, it is yet to recover from that blow. The silver lining is that people are still hopeful the situation will improve. A net 32% among those surveyed in May 2017 believe the employment situation will improve in the next one year. But that is still lower than the percentage of optimists in the December 2016 survey, or even the December 2015 survey. And it is much worse than the net 54.9% who thought that job prospects would improve in June 2014, when the present government was voted in. Those high hopes have been dashed.